Wouldn't tightening the B-tension screw not rotate the mech down and backwards therefore give the mech cage more clearance to cogs? Don't think campag mechs of this vintage have b-tension adjustment. Just a fixed tab. 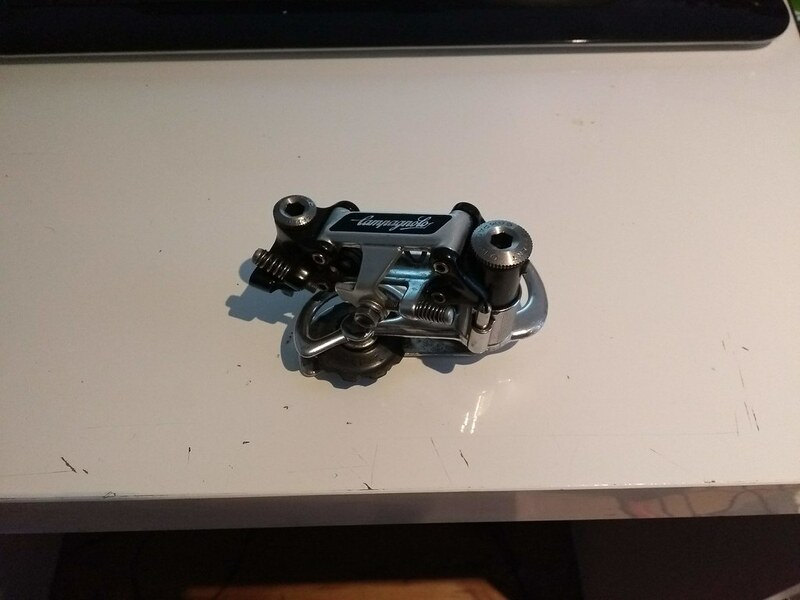 so no idea if Campag is different. 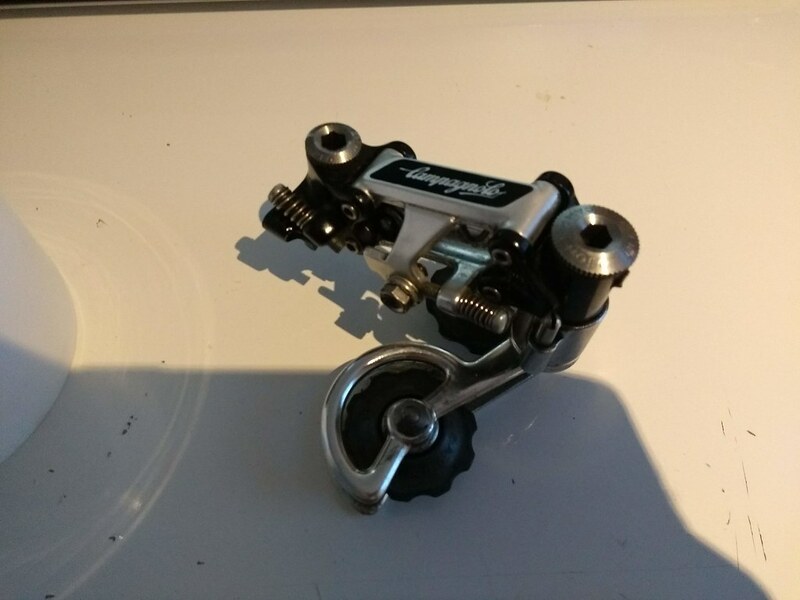 So Campag is different, at least that age of mech anyway. Think I'll be sticking to Shimano. 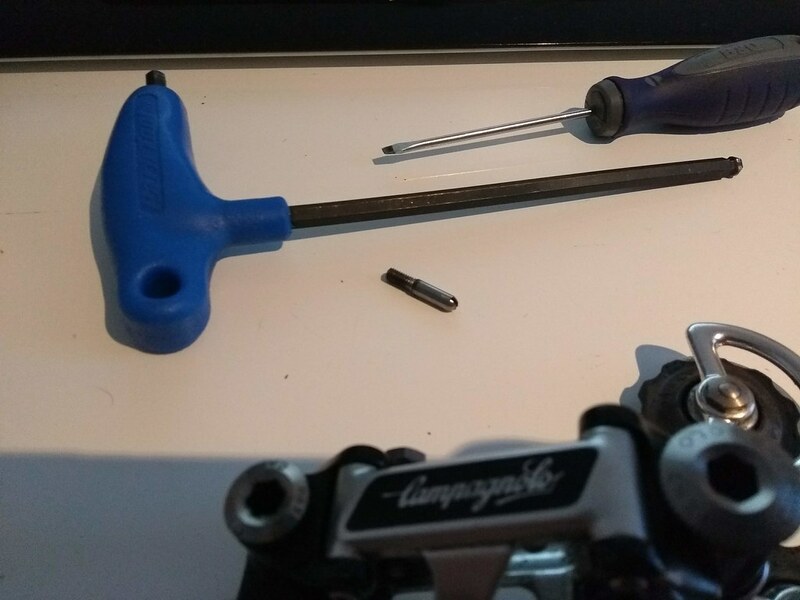 It is possible to adjust the spring tension in a Super Record derailleur. There are 3 positions you can set it to. The more tension you have (position 3), the further the top jockey wheel will sit from the freewheel. Less tension (position 1) will reduce the capacity of chain that is taken up. Be sure to rotate the parallelogram clockwise while you do it to remove the tension otherwise you'll damage the screw. Then undo the bolt that holds the parallelogram to the cage. This gives you 4 possible combinations, but 2 will give the same tension, hence 3 positions. As mentioned, check the chain length and wheel position first. In my experience, if you set them up to work with big sprockets and a big difference in chainrings (position 3), then they will be fine on the larger sprockets but a little bit fluffy changing between the smaller sprockets. Brilliant cromoman! I'd forgotten all about those holes. 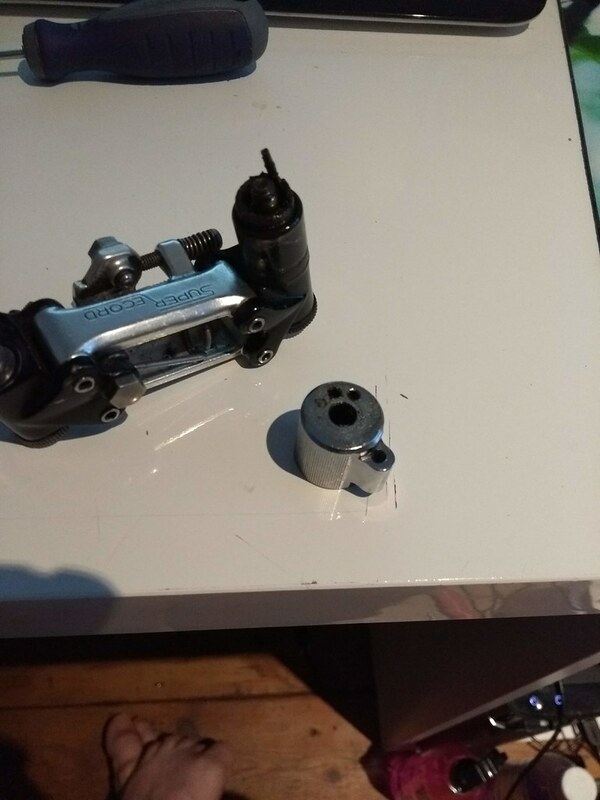 Might have to try that on mine which is being pushed a bit further than the OP's as I'm asking it to work with 26 or even 28 tooth sprockets. 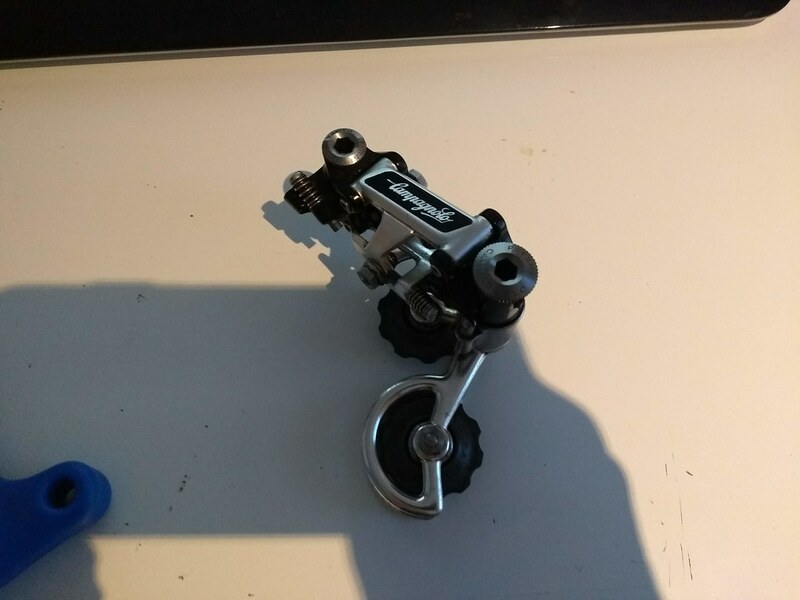 Post subject: Re: Super Record Rear Mech Rubbing! Yes brilliant cromoman! I was just going to suggest that but wouldn't have been able to go into such superb detail. I had to do exactly this on a Nuovo record recently using my very unreliable memory as I hadn't done it in at least 25 years and had to work it out as I went along, I shall be saving this tutorial for the next time I need to do it, only this time I'll be able to do it with less swearing and less greasy finger marks on my forehead from all the head scratching. IN THE QUEUE TO BE COMPLETED Falcon Pro & Falcon Majorca, Abeni Europa, Francesco Moser, Jan Jansen, Ken James, Harry Quinn, Mercian, Raleigh Record Ace, Raleigh Sirocco 1978, Raleigh Sirroco 1984, Raleigh Rapide, Falcon Westminster, Falcon Black Diamond, Raleigh Record Sprint, Navarro, Carlton Corsair, Carlton Criterium, Sun Wasp, Claud Butler Velo Capital 1963, Claud Butler Majestic, Lucasa, BSA Tour de France, Holdsworth Possibly, Another Ribble Possibly, Another I have no clue what it is. wheel in relation to the sprockets - the top jockey wheel rubs on the underside of the 25t no matter what. 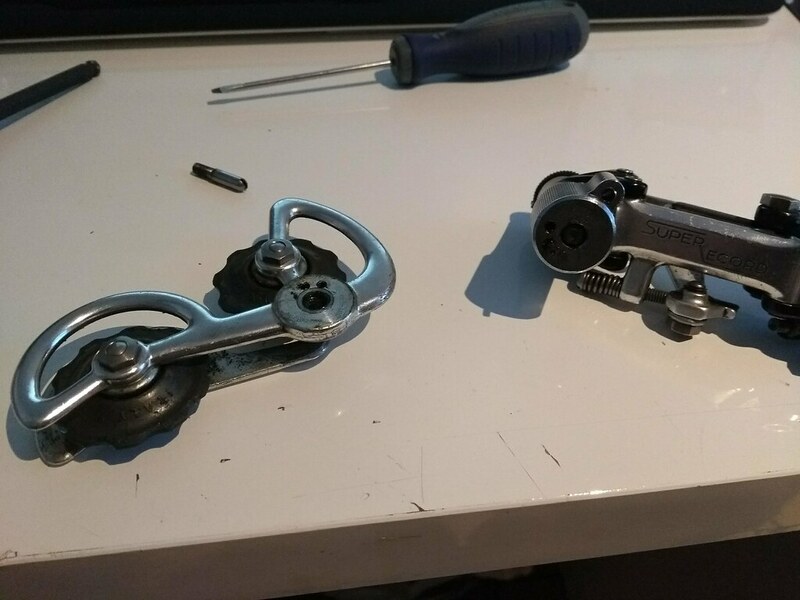 jockey cage ie that you could undo the pivot bolt and slide the cage up and down thus creating a longer jockey cage suitable for larger sprockets? Have you checked your chain length? If it's too long then there won't be enough tension when on the small chainring to encourage the jockey wheel away from the sprockets. I don't have a Super Record on a bike at the moment, but here's a Nuovo Record with a 26 cog. 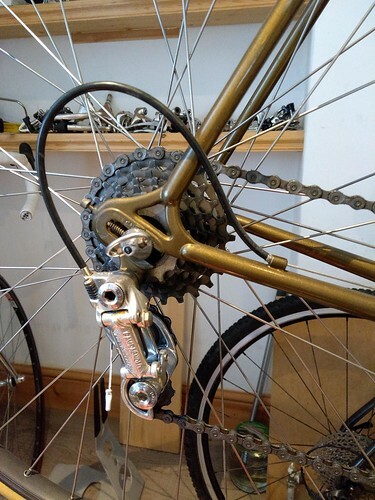 In the second photo, I've rotated the jockey wheel cage around to simulate a shorter chain. This causes the jockey wheel to move further from the block. 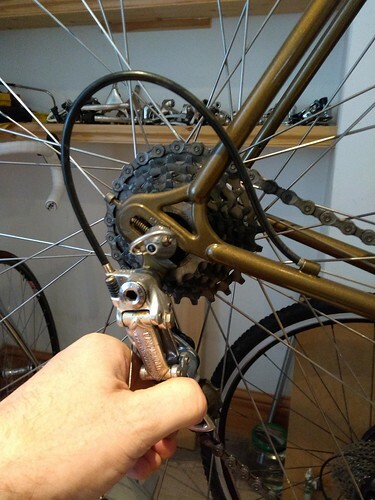 If the chain length is good, you can give yourself a little extra tension by moving the wheel backwards in the dropout. ...and the hanger's not bent inwards a fraction?